It's been quiet here, but there's been a lot happening on the Social Justice Book Club behind the scenes. First, and most exciting, is that Janani of The Shrinkette has agreed to co-host next year's club! If you're not familiar with Janani's blog, you're seriously missing out, especially as she focuses in on writing about diverse books and own voices. She's also wonderful to follow on Twitter, IG, and Litsy (@theshrinkette). I'm SO excited to have her on board for this adventure, and can't thank her enough for all the work she's already putting into making this the best group it can possibly be! 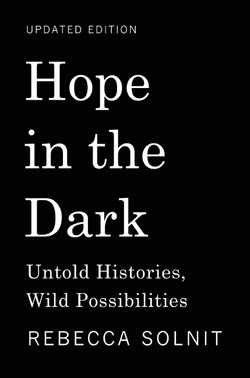 We're putting our heads together on ways to make the club more robust as we move forward, but in the meantime, wanted to share January's book selection: Rebecca Solnit's Hope in the Dark. Originally published in 2004, now with a new foreword and afterword, Solnit’s influential book shines a light into the darkness of our time in an unforgettable new edition. Though the book was originally published in 2004, it seems to be newly relevant all over again in the wake of our most recent election. And, for the next FOURTEEN HOURS, the Haymarket Books is offering completely free, no strings attached downloads of the ebook. So get on that, get your copy downloaded, check it out from your local library, and get ready to start reading on January 1st with us. More details to come on structure, along with sign-ups for next year's activities, in the coming weeks. Stay tuned!